Have you heard of Bakhshali Manuscripts? This is an ancient mathematical manuscript, dated by some scholars to be around 2nd century BC or earlier. Based on the dating, this manuscript could give an indication of whether the concept of zero was used much earlier than it is envisaged currently(around Brahmagupta time period 7th century AD). Although, the date of the manuscript is under debate, imagine the importance of this document. This is one of the interesting snippets that I found fascinating in this wonderful book of stories revolving around numbers. 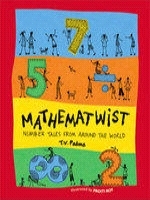 Mathematwist, is a book of 14 short stories - each story revolves around some interesting mathematical concept. The concepts vary from addition, multiplication, factorials, magic squares etc. Some of the stories are tricky and can be considered as a puzzle - like the story of 'Rounding up the Camels'. Some of the stories are written in dramatised form. It could be used by schools for putting up a drama as well. T. V. Padma's love for mathematics and history comes out through the book. Although, the book is about stories related to mathematics; after every story, there are a few pages of information on the concept dealt in the story and history related to that concept. The history and mathematics makes it a very interesting combination and in my opinion is what makes this book stand out. I am glad that T. V. Padma includes some interesting nuggets of information after every story. This almost makes the book a handy guide for mathematics teachers to introduce a concept and explain the history and significance of the concept. Proiti Roy's illustrations are lovely. I especially loved the black and white stick figures that play around numbers and the mathematical symbols. This is a great book for kids who have reached 4th standard or above in Indian educational system. They can read by themselves and enjoy the story and concept behind it. Chox, I love this book too and it is a favourite gifting option ! Stories, History, Mathematics - quite a combination. Thanks for introducing this book to me, Sathish! Thanks, all! I am so touched by everyone's lovely comments. And thrilled! The life of a writer isn't easy and it's the most wonderful thing to hear such appreciation. Thank you folks for the comments. As ranjani said earlier, it is the common gifting option that we have in our home as well. 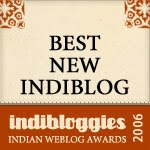 Padma Venkatraman, Many thanks for dropping by and reading the review and comments. We love your book - 'forbidden temple' as well. We love Forbidden Temple too. One of the very few books of its type available. And I still remember it was almost 4 years back that I chanced upon Mathematwist in a bookshop and feeling like I had stumbled upon some treasure. I bought all the copies there were - which was 3. Am glad the book is more easily available now.